I often hear people say like this: when I have a renewed interest in calligraphy as an adult, I have no idea as to where I should begin from or how to appreciate a piece of calligraphy works. To answer these questions, I would like to show here a few fundamental points of learning calligraphy, including dual approaches of seeing and manual ways of learning. 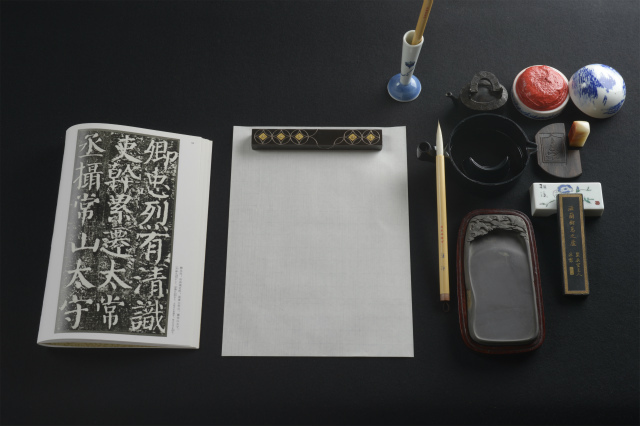 Among materials above-mentioned, brush, sumi inkstick, inkstone, and paper are called four treasures of the study. 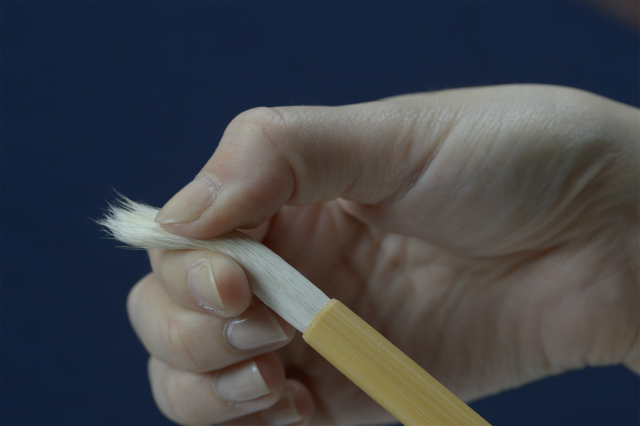 Brushes are made of soft goat hair, a little rigid horse hair, weasel hair and so on. Which one is better depends on your liking, but for beginners I recommend one made of a mixture of various hairs which is easy to use. In addition, brushes are classified according to the thickness of the brush stick. Generally speaking, the thickness No.3 and No.4 are suitable, but I recommend you to try to examine with your own hand to see which one is fitting. or bokueki. Solid form of ink is considered better for its longer lapse of time since its production just as the case of wine, because it allows us to express richer quality of lines. However, those who would like to practice a lot at one time could use liquid form of ink, for good quality of liquid ink is available at stores. 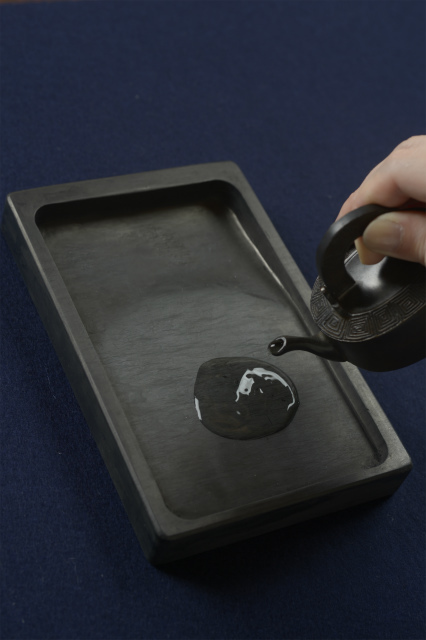 As for inkstone, good one is for sumi inkstick to be made fine and even when ground, but rather expensive. When using liquid ink, it is stored an ink pod called “bokuchi”, there being no need of grinding inkstick. Liquid ink is very convenient, because rough surface of an inkstone doesn’t give damage to the brush, a lot of ink can be used, and it is easy to wash away with water. 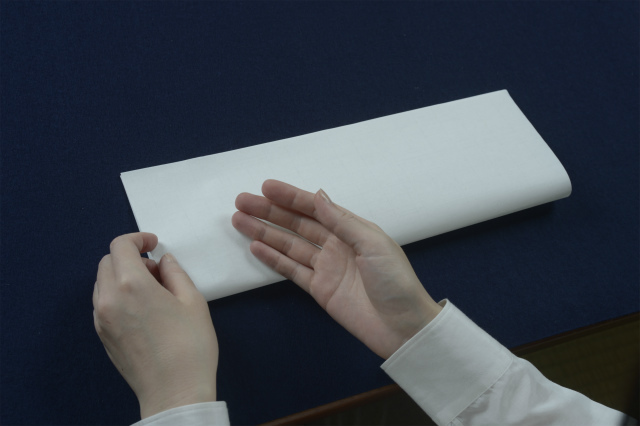 What kind of paper you choose is very important. Because the quality of paper has much to do with quality of lines (smoothness of brushstroke)or colors of sumiink(bleeding and blurs). You had better consult a staff of the store telling him or her what kind of calligraphy works you would like to produce. But in the case of stuff for practice, an inexpensive package of paper of 1000 pieces will do, as long as they are easy to use.